N. Berwick and the golf there, the beautiful countryside, good food, nice people. 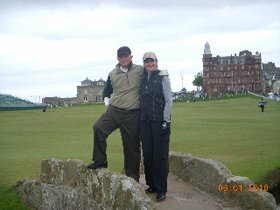 When we got to the Old Course Hotel, it exceeded all expectations. What a wonderful hotel. The room was roomy and great, the breakfast was the best, and the golf! What wonderful tee times and the weather cooperated during our stay. We got home after 18 hours of travel! We have been looking at our pictures and remembering all the fun we had. Thank you both so much for all you did to make this a great trip.